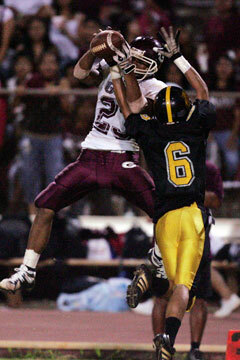 Elijah Lesu of Farrington pulled in a pass in front of McKinley's Josh Nakama last night. Hercules Sula rushed for 171 yards and seventh-ranked Farrington used a 22-point fourth quarter to rally past No. 8 McKinley 35-21 last night at Mililani High School. The victory propelled the Governors to 4-1 in the Oahu Interscholastic Association Red East and kept them in a first-place tie with Kahuku. They did it with a strong second-half turnaround. "We made a lot of changes during halftime. The coaches talked about how the seniors gotta step up," defensive end Andrew Noga said. "McKinley came out strong. I was a little bit surprised, but we never gave up." Coach Randall Okimoto did not mince words when he spoke to his squad about first-half mistakes. "I don't usually bark at my guys, but you can't have sloppy play two weeks in a row," he said, referring to last week's loss to Kahuku. "We finally got Hercules the ball. I'm happy for him." McKinley fell to 3-2 in league play (4-3 overall) despite scoring 21 points with a backup quarterback, Isaac Iuta, against one of the league's top defenses. "I'm really proud of how our team played," coach Bobby Grey said. "I'm really proud of how well Isaac played." The Tigers finished with 249 total yards and only one turnover. They had a meager 62 yards in the second half. Farrington amassed 398 total yards, including 296 on the ground. Maeli Siliga added 80 yards on 12 carries and three touchdowns. Sula and his offensive line took command in the second half against a tiring McKinley defense. The 5-foot-9, 165-pound senior tallied 102 yards after intermission as the Govs controlled the ball for 16 minutes and 51 seconds. McKinley's offense drove 65 yards and took a 21-7 lead on Kalama Keawe's 5-yard touchdown run with 5:03 remaining in the third quarter. After that, the Tigers had consecutive three-and-outs in their final three possessions. Farrington took command after Keawe's touchdown, marching 65 yards in six plays to paydirt. Siliga, in his third start at quarterback since a hand injury to starter Elijah Filifili, scored on a 6-yard bootleg to bring the Govs within 21-14 with 2 minutes left in the third quarter. McKinley, which had 259 total yards with Iuta in charge, was unable to mount another scoring drive against a resurgent Gov defense. Farrington drove 50 yards in just five plays on its ensuing series. Sula scored from 7 yards out on a toss sweep to the right to bring his team within 21-20 with 11:44 remaining. On the PAT, the Govs caught the Tigers off-guard. Holder Alefesio Iu, a former junior varsity quarterback, fired a pass to Trendt Marsom on an out pattern, and Farrington took its first lead, 22-21. "That took a lot of momentum away, and the three-and-out after that (by McKinley) didn't help our defense," Grey said. "Our defense was on the field for almost the whole second half." The Govs' calculated risk wasn't worrisome. "Momentum was on our side and there was a lot of time left if we missed it," Okimoto said. The McKinley offense sputtered, and Farrington took over at its 14-yard line with 9:32 left. The Govs pounded away at the fatigued Tiger defense all the way to the end zone. Fourteen plays into the drive, Siliga scored on a keeper to the left for a 5-yard touchdown. Keelan Gonda ran for a 145 yards on 24 carries and one touchdown as the Surfriders defeated the Menehunes. Kailua's Zachary Akamine threw for one touchdown and ran for two others. Jordan Monico rushed for 73 yards and passed for 142 in the loss. Bryant Moniz passed for two scores and ran for another to lead the Mules over Na Alii. Aiea's Lofa Liilii opened the night's scoring with an 85-yard punt return before Leilehua got on the board with a 21-yard field goal from Micah Uehara. The Rams closed the game with 37 unanswered points in a rout of the Hurricanes. Radford quarterback Epa Maika threw for three scores after Mason Koa gave Kapolei a brief 7-0 lead. Antoin Dewalt ran for 120 yards on 10 carries with a pair of touchdowns as the Chargers routed Na Koa. Pearl City quarterback Kawika Borden only attempted 10 passes, but completed nine of them for 189 yards and a touchdown. Issac Saffery rushed for four touchdowns as the Cougars rolled to a win over the Rough Riders. James Saffery and Kalua Noa also scored in the rout. Pun--Dalton Hilliard 56 run (River Kim kick). Iol--Justin Yamamoto 7 run (Kody Adams kick). Pun--Manti Teo 4 run (Kim kick). Pun--Miah Ostrowski 36 pass from Brett Kan (pass failed). Pun--Ostrowski 15 pass from Kan (Kim kick). Pun--Safety, Siu Tafuna tackled punter in end zone. Pun--Hilliard 33 run (Kim kick). Iol--Reid Furukawa 8 pass from Ryan Dung (Furukawa run). Iol--Ronnie Hirokawa 15 run (Adams kick). Pun--Hilliard 1 run (Robert Izuta kick). Pun--Christopher Wong 62 run (kick failed). RUSHING--Punahou: Hilliard 14-120, Wong 3-93, Kainoa Carlson 4-23, Teo 2-5, team 1-(-1), Kan 2-(-2). Iolani: Yamamoto 20-83, Travis Muraoka 2-28, Hirokawa 1-15, Dung 2-12, team 1-0, Kela Marciel 2-(-6). PASSING--Punahou: Kan 22-32-1-301, Pono Akina 1-4-1-8. Iolani: Dung 23-47-3-299, Marciel 0-3-0-0. RECEIVING--Punahou: Ostrowski 8-128, Kim 5-94, Hilliard 3-29, Kyle Whitford 3-28, Carlson 3-22, Tobie Reeuwijk 1-8. Iolani: Furukawa 8-72, Lionel Fujioka 7-53, Hirokawa 5-143, Aaron Fong 1-13, Yamamoto 1-9, Jordan Nakamura 1-9. Kam--Charles Soon III 15 pass from Michael Hoke (Tyler Akao kick). Kam--Ian Bernardino 5 pass from Hoke (Akao kick). Kam--Soon III 55 pass from Hoke (Akao kick). Dam--Christian Vasconcellos 21 pass from George Martin (Martin run). Kam--Truman Chun 9 run (Akao kick). Dam--Kama Bailey 72 punt return (Wayland Sakamoto kick). RUSHING--Kamehameha: Chun 10-112, Ryan Montez 10-54, Kaulupono Perez 6-14, Anelkokoa Osorlo 1-11, Jordan Rego 2-3, Hoke 4-(-20). Damien: Bailey 18-29, Rein Ota 3-24, Martin 7-(-30). PASSING--Kamehameha: Hoke 5-13-94. Damien: Martin 6-23-1-46, Bailey 0-1-0-0. RECEIVING--Kamehameha: Bernardino 1-5, Soon III 2-70, Kanekua Friel 2-17. Damien: JJ Kaina 2-7, Bailey 2-16, Ota 1-2, Vasconcellos 1-21. Kah--Richard Torres 10 run (kick failed). Cas--Corey Paredes 70 blocked field goal return (run failed). Kah--Gary Nagy 80 kickoff return (Kaika Sasaoka kick). Kah--Torres 17 run (Sasaoka kick). Cas--Paredes 13 pass from Bryson Ukauka (run failed). Kah--Shiloah Teo 15 run (Sasaoka kick). Kah--Kaliki Unga 19 run (Sasaoka kick). RUSHING--Castle: Damian Spotkaeff 9-31, Andrew Fakatoka 3-5, Jesse Humalon 1-(-9), Team 1-(-11), Ukauka 8-(-30). Kahuku: Junior Mataafa 11-97, Unga 19-93, Torres 8-54, Neal Lokotui 12-44, Teo 3-18, Blane Beatty 3-5, Jordan Kapu 1-2, Courtne Nozawa 1-2, Ian Fujinaga 1-1. PASSING--Castle: Ukauka 15-24-1-161. Kahuku: Torres 1-4-1-24. RECEIVING--Castle: Keiter-Charles 5-81, Humalon 3-9, Paredes 2-29, Spotkaeff 2-23, Sheldon Bastatas 1-14, Bronson Kekahuna 1-5, Seth Estioko 1-0. Kahuku: Kapu 1-24. McK--Josh Nakama 48 pass from Isaac Iuta (Marcus Amonin kick). Far--Hercules Sula 12 run (Matt Stowers kick). McK--Keawe Kalama 1 run (Amonin kick). McK--Kalama 7 run (Amonin kick). Far--Siliga 6 run (Stowers kick). Far--Sula 7 run (Trendt Marsom pass from Alefesio Iu). Far--Siliga 5 run (Stowers kick). Far--Siliga 16 run (kick failed). RUSHING--Farrington: Hercules Sula 21-171, Maeli Siliga 12-80, Joshua Fernandez 5-48, Elijah Lesu 1-(-3). McKinley: Kalama 16-68, Iuta 14-31, Alan Hashimoto 2-4, Tuimatagalu Togia 1-2, Mike Lekona 2-(-2), Jarett Luna 1-(-2). PASSING--Farrington: Siliga 9-16-2-102. McKinley: Iuta 9-16-1-148. RECEIVING--Farrington: Lesu 6-76, Sula 2-17, Fernandez 1-9. McKinley: Davis 3-90, Nakama 2-51, Josh Ward 1-6, Luna 1-1, Hashimoto 1-0, Kalama 1-0. Kail--Keelan Gonda 7 run (Timothy Maghinay kick). Kail--Zachary Akamine 1 run (kick failed). Kail--Shawn Forges 12 pass from Akamine (Gonda run). Moan--Pono Tiave 65 pass from Jordan Monico (kick failed). Moan--Montay Rover 5 run (pass failed). Moan--Monico 65 run (kick failed). Kail--Akamine 1 run (kick failed). RUSHING--Moanalua: Monico 11-73, Kirk Hubbard 10-39, Jarin Salvador-Atabay 5-20, Chazman Laaoili 1-14, Rover 2-10, Robbey Eusibio 1-2, Tiave 2-(-3). Kailua: Gonda 24-145, Akamine 7-45, Travis Holeso-Wolfe 7-28, Kaleo Wong 2-19, Forges 1-16, Darrin Sugimoto, 1-12, William Kekuoha 1-(-2). PASSING--Moanalua: Monico 5-12-2-142, Salvador Atabay 0-1-0-0. Kailua: Akamine 4-9-1-45. RECEIVING--Moanalua: Tiave 3-102, Salavdor-Atabay 1-20, Savaii Eselu 1-20. Kailua: Sugimoto 2-11, Ganda 1-22, Forges 1-12. Aiea--Lofa Liilii 85 punt return (pass failed). Aiea--Bryan Echalas 1 pass from Alfredo Higa (kick failed). Aiea--Liilii 30 pass from Higa (Echalas pass from Higa). Lei--Martin Iosefo 16 pass from Bryant Moniz (Uehara kick). Lei--Moniz 20 run (Uehara kick). Lei--Iosefo 11 pass from Moniz (Uehara kick). RUSHING--Leilehua: Micah Abreu-Layson 12-83, Bryant Moniz 6-63, Alex Cruz 2-23, Paul Hernandez 5-11, Bronson Pausa 2-4. Aiea: Daniel Liilii 4-4, Alfredo Higa 11-2, Lofa Liilii 2-(-1). PASSING--Leilehua: Bryant Moniz 17-34-1-221. Aiea: Alfredo Higa 23-39-0-239, Liilii 1-1-0-21. RECEIVING--Leilehua: Martin Iosefo 8-145, Elijah Manaea 4-30, Allan Macam 2-29, Kaipo Derego 2-8, Pausa 1-7. Aiea: Lofa Liilii 9-114, Daniel Liilii 6-49, Alan Fonoti 4-55, James Buchanan 3-20, Higa 1-21, Bryan Echalas 1-1. Kap--Mason Koa 1 run (Curtis Kiyabu kick). Rad--Scott Ruhl 31 pass from Epa Maika (Maika kick). Rad--Kyle Blair 49 pass from Maika (kick failed). Rad--Justin Lord 16 pass from Maika (kick failed). Rad--Ezekiel Pulou 2 run (kick failed). Rad--Jonathan Atangan 30 run (kick failed). Rad--Thomas Daniels 45 interception return (kick failed). RUSHING--Radford: Maika 12-(-19), Pulou 17-99, Atangan 2-30. Kapolei: Koa 11-102, Kamuela Foki 4-12, Jason Recamara 1-9, Cyril Ontai 3-25, Kiyabu 1-(-15), Daniel Nacnac 1-7, Brian Tabion 1-5, Kelii Tolentino 3-(-9), Kurt Navarro 1-4, Team 1-(-20). PASSING--Radford: Maika 13-27-0-242, Lord 1-2-0-49. Kapolei: Koa 12-20-5-184, Tolentino 0-6-3-0. RECEIVING--Radford: Blair 4-110, Lord 4-66, Ruhl 5-100, Stephen Jenkins 1-15. Kapolei: Nate Dixon 2-23, Caleb Spencer 3-40, Kiyabu 2-14, Recamara 1-10, Foki 2-101, Josh Hose 2-(-4). Kais--Tukia Aholelei 1 rush (Kyle Niiro kick). Kais--Issac Saffery 17 rush (Niiro kick). Kais--Saffery 43 rush (Niiro kick). Kais--James Saffery 60 interception return (Niiro kick). Kais--I. Saffery 48 rush (kick failed). Kais--Kalua Noa 17 pass from Skylar Chan (kick failed). Kais--I. Saffery 1 rush (Andrew Wingert kick). RUSHING--Kaiser: I. Saffery 21-264, Kelii Maikui 7-45, Chan 4-8, Noa 1-6, Aholelei 2-5, Sid Slon 1-(-2). Roosevelt: Tony Fautanu 1-3, Shaide Quisano 5-(-6), Hai Chi Nguyen 4-(-29). PASSING--Kaiser: Chan 5-10-0-70. Roosevelt: Nguyen 8-20-3-78. RECEIVING--Kaiser: Noa 3-42, Maikui 2-28. Roosevelt: Kaul Kauolulo 4-54, Owen Furuta-Harada 2-16, Alex Fowler 1-35, Kealli Lacy-Nahale 1-4, Vincent Chianese 1-4. KK--Shannon Kamakaokalani 5 run (pass failed). KK--Kamakaokalani 27 run (Kamakaokalani run). KK--Kamakaokalani 25 run (Kamakaokalani kick). KK--Jeremiah Silva 20 pass from Shelton Bangasan (Kamakaokalani kick). Pac--Mark Miller 57 pass from Buta Wilhelm-Ioane (pass failed). KK--Edrian Dela Cruz 6 run (kick blocked). KK--Javan Fulton 16 run (kick failed). KK--Fulton 75 run (Kamakaokalani kick). KK--Akeakamai Naeole 5 run (run failed). KK--Dela Cruz 1 run (Bagnasan kick). Pac--Jordan Kahalekai-Bermoy 12 run (Thomas Cortez kick). KK--Matt Casil 31 run (Bangasan kick).